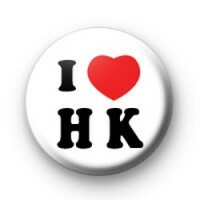 I Love HK badge in white with I Love HK written in black with a red love heart. These I Love Hong Kong badges are inspired by the I Love NY badges which have become famous. If you are living in Hong Kong or are originally from this region of China, then these badges are absolutely perfect. We have a range of I Love badges with different city names on them, so be sure to grab the badges for the cities you love. Always great if you are going on holiday to Hong Kong and want to show your appreciation for the people & culture. Standard 25mm I Love Hong Kong badge made by hand in our family workshop. International delivery available on all orders & delivery is free on larger orders.